Newspapers have been one of the most prevalent means of sharing news, events, and opinions with people since the 17th century. In modern times, the newspaper has become synonymous with the image of a business professional, working their way up the ladder by staying informed and educated. Even after the invention of television, the newspaper retained its relevance. With so many centuries of newspapers full of human history, it’s important to many people and organizations that newspapers be preserved by newspaper archival services. No one wants to lose the years of social and scientific evolution that is represented by the information in newspapers. Historic preservation requires special skills that only a trained newspaper archival service can guarantee they have. For one thing, newspapers are generally folded or rolled up. Flattening these documents for archival preservation means that a careful application of humidity must be used to “iron” out the paper. This is very delicate, because too much humidity can cause the paper to disintegrate if it is very old. Newspapers also must be cleaned before being stored by a newspaper archival service. Many papers go through mud or get dusty from being stored in basements. Only natural fiber brushes should be used to gently wipe clean a delicate newspaper. Newspaper materials are very thin and can rip easily, so you should ensure that your archival service has experience with newspaper when you hire them. 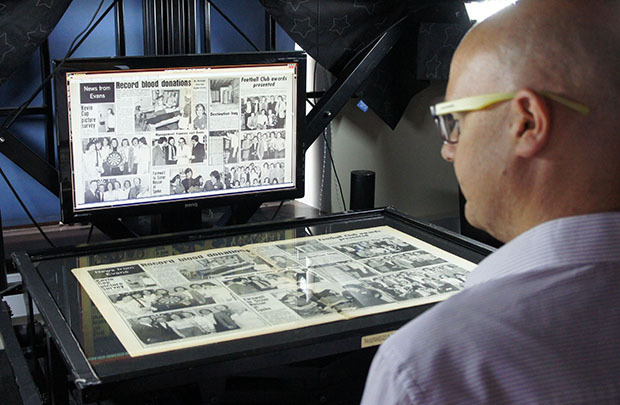 Another method of preservation that may be performed by newspaper archival services is encapsulation. This works especially well for newspaper clippings. This method seals the paper completely, in a plastic or wax material, and keeps it in the current condition for much longer. Whichever methods you choose, the right newspaper archival services can make it easy for you to share your history with future generations. eRecordsUSA is specialized in providing Newspaper Archival Service / Newspaper Archiving Services / Newspaper Scanning Services. Would you like to receive a free quote for Newspaper Archival Services? Call +1.855.722.6669 or eMail us at info@eRecordsUSA.com. eRecordsUSA offer Newspaper Archival Services in following areas of California, San Jose, Sunnyvale, Mountain View, Silicon Valley, Santa Clara, San Mateo, San Francisco, Redwood City, Marin East Bay: Fremont, Livermore, Contra Costa, Hayward, Milpitas, Pleasanton, Concord, Oakland, Alameda, San Ramon, Dublin, Napa Valley: Vallejo, Sonoma, Santa Rosa, Pittsburg, Fairfield, Petaluma, Solano & Martinez.